Rinaldi's district in northwest Dallas County was one of five targeted by Dallas-Area Interfaith, a group that organized canvassing and phone banks to pump up voter turnout. Rodriguez said she had quietly fumed when Rinaldi called ICE on protesters, but took action and began pushing parishioners at another Catholic church to vote. She’d talked to them about the size of the Hispanic population, which in Dallas County is 40 percent and larger than any other group. “Hispanics are the majority and we continue to think like minorities,” Rodriguez said. Interfaith organizer Socorro Perales said members were determined to get more people to the polls. Two weeks before polling began, the nonpartisan group held a community event at a church that brought in 2,000 people and five candidates, all Democrats. “They are learning to organize, strategize, and this actually works,” Perales said. All five candidates won, including Colin Allred, the Democrat who beat Republican incumbent Rep. Pete Sessions, a staunch ally of Trump, in the District 32 race for Congress. Perales said she didn’t go after the low hanging fruit — those registered who had previously voted. Instead, she sifted through lists of registered voters who didn’t vote in the last election. On Sunday, October 14th 2,000 leaders and parishioners from Dallas Area Interfaith assembled at the Christian Chapel Temple of Faith to challenge candidates from the Texas Tribune’s 2018 Hotlist, including Texas House Districts 105, 107, 114, and 115, and US Congressional District 32. Republican and Democratic candidates for Coppell, Richardson, and Dallas Independent School District School Board positions also participated. The assembly and Get Out The Vote actions are the culmination of a two-year campaign on behalf of the families and communities of Dallas. 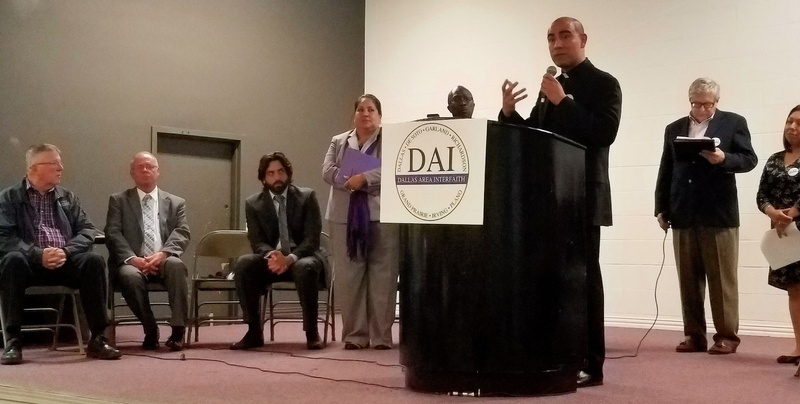 Less than a year ago, DAI leaders successfully negotiated with Police officers of the cities of Dallas, Farmers Branch, and Carrollton to accept Catholic Parishes ID’s as a form of identification. For immigrant families, having a photo ID could help prevent deportation. Since then, the parish ID strategy spread to the East Coast through DAI’s sister organization in Baltimore, BUILD. Leaders from BUILD testified at the October 14th assembly that Baltimore police officers have committed to accepting the IDs as a valid form of identification. Since then, leaders have pushed forward with parish-based Get Out The Vote walks across the Dallas area, knocking on hundreds of doors so far and contacting thousands of voters by phone. DAI has also partnered with the business community in a joint press conference to encourage voters to participate in the midterm elections. 700 PCIC leaders packed the parish hall of St. Pius X Catholic Church to secure commitments from candidates for federal, state and local office around an agenda that included immigration and food security at the federal level, and workforce development, education and healthcare at the state and local level. Candidates that attended included Congressional Representative Ann Kirkpatrick (CD 2), Pima County Board of Supervisors’ Chair Richard Elias, and Tucson Mayor Jonathan Rothschild. Religious leaders in attendance included Catholic Monsignors Raul Trevizo and Tom Cahalane, Episcopal Rector Robert Hendrickson (St. Philip’s), Rabbi Tom Louchheim (Or Chadash), Lutheran Dean & JobPath Board Chair Steve Springer (Dove of Peace), and Methodist Pastor Sharon Ragland (St. Mark’s). Bruce Dusenberry, former Chamber of Commerce Chair and Board of JobPath, Flowing Wells School Superintendent David Baker, and Community Food Bank President Michael McDonald also participated. Hundreds of PCIC leaders helped Get Out The Vote through election day, resulting in a 70.5% voter turnout rate in Pima County -- the highest in recent history. Candidates who committed to the agenda won their elections, including one State House seat and one US Congressional seat (CD-2). The City Parks & Recreation Bond also passed. TMO leaders organized seven civic academies across Harris County to educate voters about an upcoming County Bond election. Guests, including Bayou City Initiative’s Jim Blackburn, Harris County Flood District Representatives, and Commissioner Ellis’ staff, joined the meetings. TMO leaders then organized follow up phone banks to reach thousands of voters during the early voting period. In the largest celebration of multiple events, Bishop Daniel E. Flores blessed the opening of a new library in Las Milpas, surrounded by Valley Interfaith leaders, children from Carmen Anaya Elementary School and other community supporters. An assembly chronicled the community-driven effort that went into changing the political culture of South Texas, reflected in the construction of the new library that leaders had fought for and won. Former Mayor Pro Tem Monica Alonzo, who waited until the day before the election to support Dallas Area Interfaith's agenda in support of affordable housing and early childhood education, lost the runoff by 291 votes - the largest margin of three runoff races that day. After forcing a runoff election into June, COPS/Metro Alliance leaders organized a second nonpartisan "Get Out The Vote Rally" with over 350 people to reaffirm public commitments made by mayoral and city council candidates. Leaders (again) asked candidates to recommit their support for increased funding for owner-occupied home improvements (described as a way to help long-time residents age-in-place), protections for undocumented immigrants, and a raised living wage standard for municipal workers. Some candidates agreed to aggressively push the organization's goals. Others remained conspicuously absent.